We recently had the pleasure of working with a Raleigh homeowner who called us with dreams of the ultimate outdoor entertaining space. 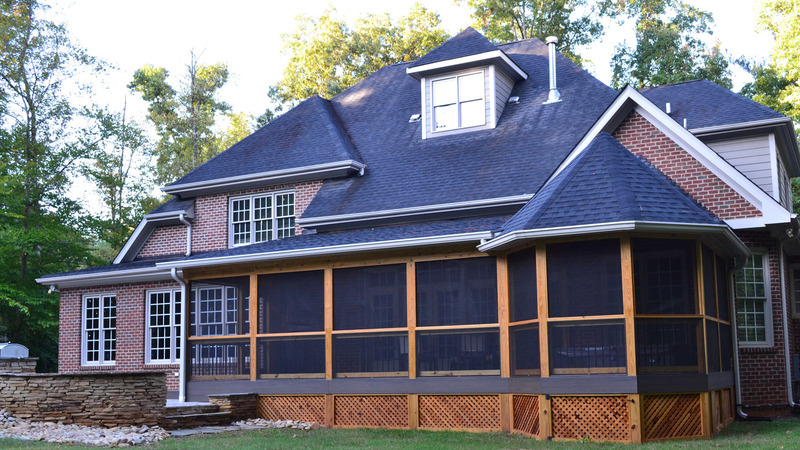 He wanted a large screened porch that would enclose his hot tub and give him plenty of outdoor living space. 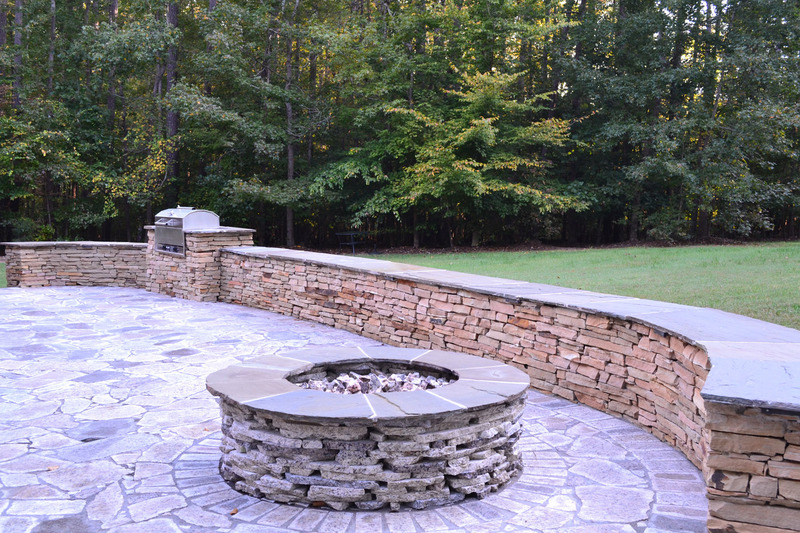 He also wanted to create an open patio featuring a fire pit and space for a barbecue grill. With a particular building material in mind, the homeowner introduced us to Sandy at EarthStone Products and launched a lasting collaboration. For this project, our expert design team worked hand-in-hand with EarthStone Products to create a custom design to meet all of the homeowner’s needs. With outdoor entertaining being the main priority, we designed an expansive low-maintenance screened-in porch for entertaining. This included an octagonal screened-in area outside of the master bedroom for the recessed hot tub. Situated outside of the porch, EarthStone’s charming and equally expansive recycled granite patio with a fire pit and built in grill completed the combination project design. We recommended TimberTech Legacy decking for the porch to provide a low-maintenance solution for the relaxed lifestyle the homeowner was seeking. With the combination of TimberTech Mocha and Pecan colored boards, we created a gorgeous custom design that complimented the home and the new patio beautifully. The TimberTech Legacy Mocha picture framing and parting boards are design details that ensure this room embodies the nature and finish of this truly custom job. 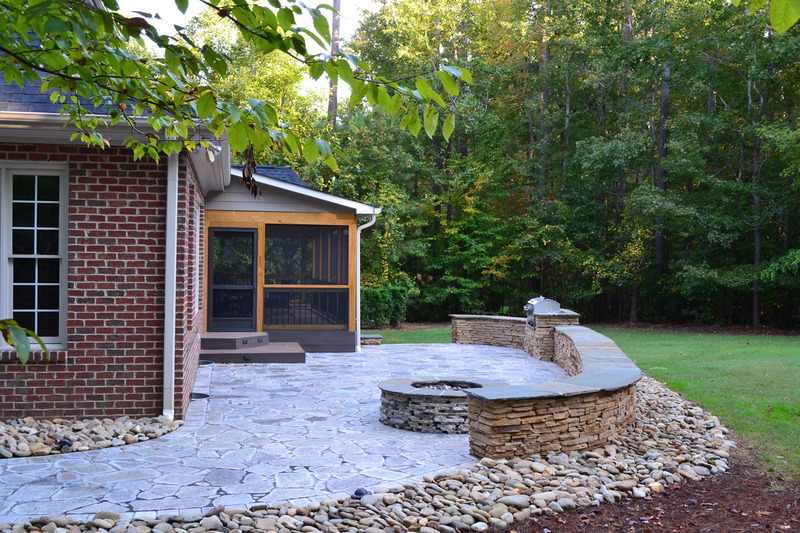 This Raleigh recycled granite patio was created with flagstone-shaped pavers for a rustic look. The gorgeous design matches the stacked stone retaining wall and natural-colored stained wood of the screened porch perfectly. EarthStone recycled granite pavers are an ecologically responsible choice providing durability without sacrificing aesthetics. Made from 100% post-industrial waste, the blocks are four times stronger than concrete. With their textured non-slip surface, recycled granite pavers are perfect for high traffic walkways and patios. Successfully attaching a new room to an existing home often comes with some architectural challenges. For this project, we needed to create a custom roofline that could successfully tie multiple outdoor areas to the home with great visual appeal. The hip roof over the octagonal hot tub space combined with the shed roof over the main living area make for a unique porch design was our design challenge solution. 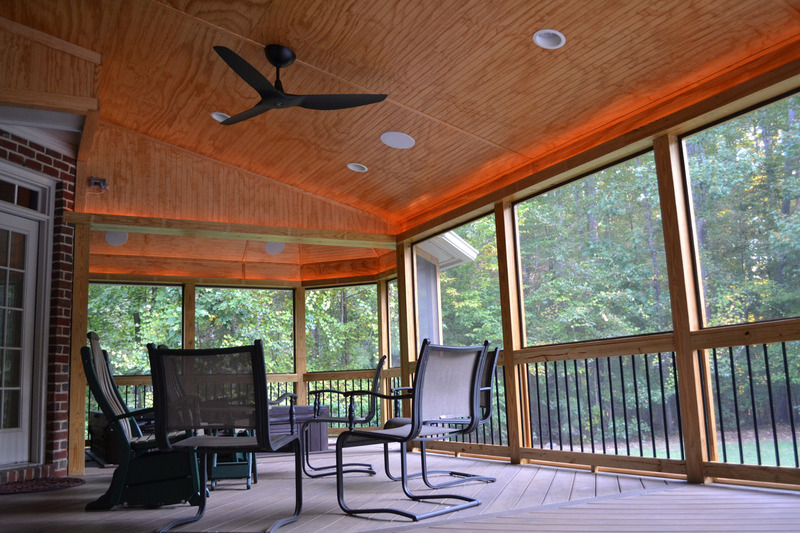 This Raleigh screened porch features built-in surround sound, recessed lighting, and ambient party lighting along the soffit for a more dramatic effect when the homeowner wanted to entertain. With the flip of a switch, our client and his friends can enjoy flickering flames over lava rock in his new gas outdoor fire pit. The stacked stone sitting wall stretches through the outdoor kitchen to provide functional seating, to define the space, and to tie in visually with the rest of the rustic design. By working in close partnership with EarthStone, we were able to streamline the design and construction phases for our client. The cohesive project was completed in one simultaneous construction stage, allowing the homeowner to enjoy his new porch and patio more quickly than other combination projects. We are happy to work with other providers to deliver the best project for our clients. 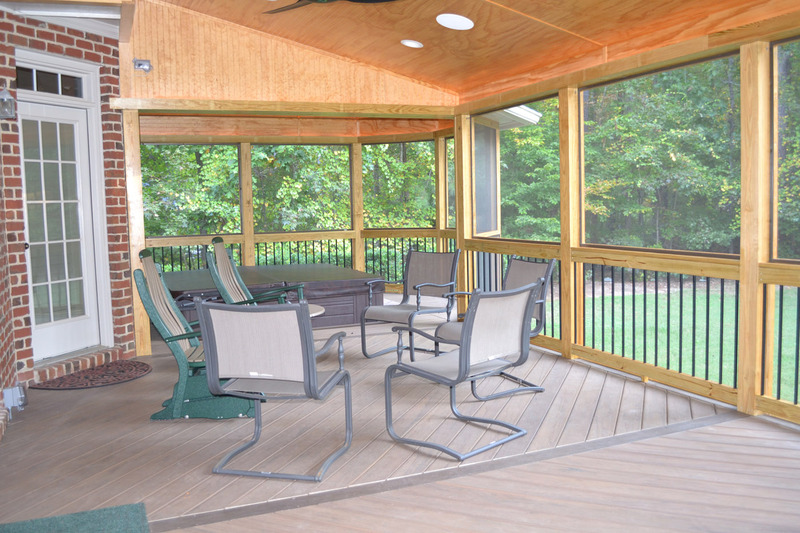 The expert design and custom craftsmanship of this Archadeck of Raleigh-Durham outdoor space will be loved and enjoyed by this homeowner and his guests for many years to come. 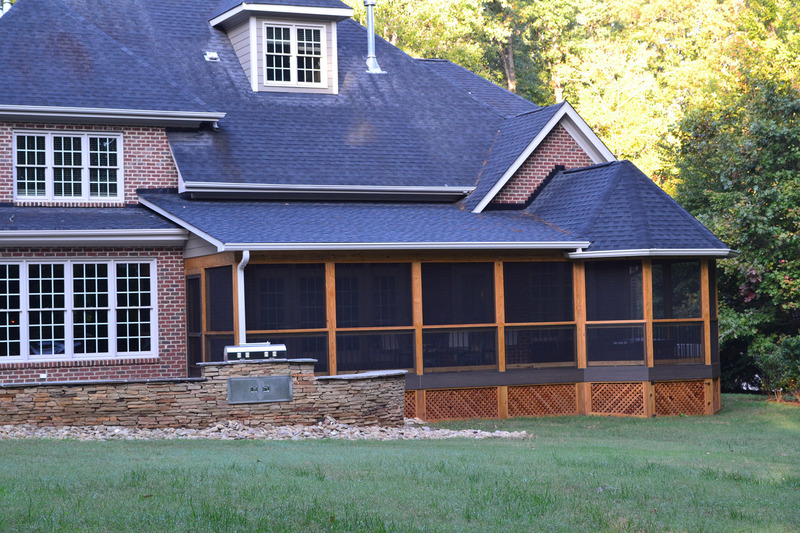 If you’re dreaming of the perfect outdoor retreat for your family, call us today: 919-973-1523. We look forward to working with you!